We are now accepting proposals from installation and performance artists interested in activating the grounds of 2019’s New York City Poetry Festival! The New York City Poetry Festival takes great pride in its arts program, which has featured nearly 200 visual, installation, and performances artists over the years. By reaching outside the established poetry communities, The Poetry Society of New York hopes to create new audiences for poetry and facilitate collaborations between poets and other artists. 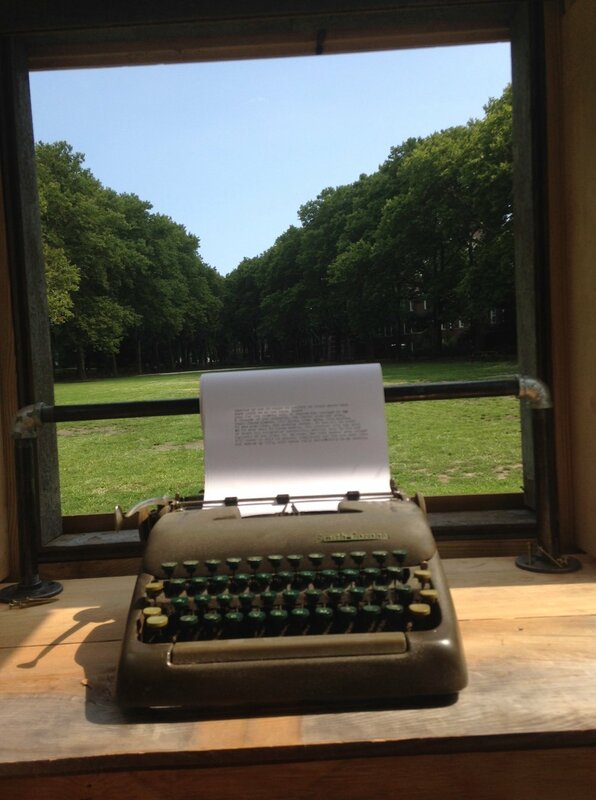 The Typewriter Project’s inaugural concept, Subconscious of the City, is a series of site-specific literary installations which invite passersby to join in a citywide collaborative poem that exists in both the analog and digital realms. These typewriter booths are each outfitted with a vintage typewriter, 100-foot long paper scroll, and a custom-built USB Typewriter™ kit, which allows every keystroke to be collected, stored, and posted online for users to read, share, and comment upon. The project is inspired by the idea of an Exquisite Corpse, a surrealist writing game in which several authors contribute to one poem. Each entry can be its own distinct lyric, but we hope that users will also be influenced by what was written before them on the scroll. By creating a new and unique form of public dialogue, this project hopes to capture something of the sound, narrative, and nuance of specific corners of our cities. The project’s mission is to investigate, document, and preserve the poetic subconscious of the city while providing a fun and interactive means for the public to engage with the written word. Read the latest entries at subconsciousofthecity.com. The Poetry Brothel is an immersive literary cabaret. Inspired by the turn- of-the-century brothels in New Orleans, Paris, and Buenos Aires, many of which functioned as safe spaces where fringe and avant-garde artists could experiment and perform their work, The Poetry Brothel presents a rotating cast of poets, each operating within a carefully crafted character, who impart their work in public readings, spontaneous eruptions of poetry, and most distinctly, as purveyors of private, one-on-one poetry readings. At the New York City Poetry Festival, The Poetry Brothel will take over the monument dedicated to Governors Island's founding, located on Colonel's Row, and turn it into their stage for the day. Enjoy poetry, live jazz, vaudeville, mysticism, and more! Milk Press believes strongly in fostering collaborations between poets and visual artists and has therefore stepped up to curate two galleries - one indoor & one outdoor - of visual art at NYCPOFEST! The galleries will be activated each day by poets and performance artists, so please feel free to send in your visual, installation, performance, or poetic work for consideration. To learn more about Milk Press, please visit milkpressbooks.com & submit your work via Submittable.